There are six new challengers in Speed Freeks – come meet the contestants in the Orkiest destruction derby the Grimdark has ever seen! Today, we’re going over the first half of the racers you’ll find in Speed Freeks. 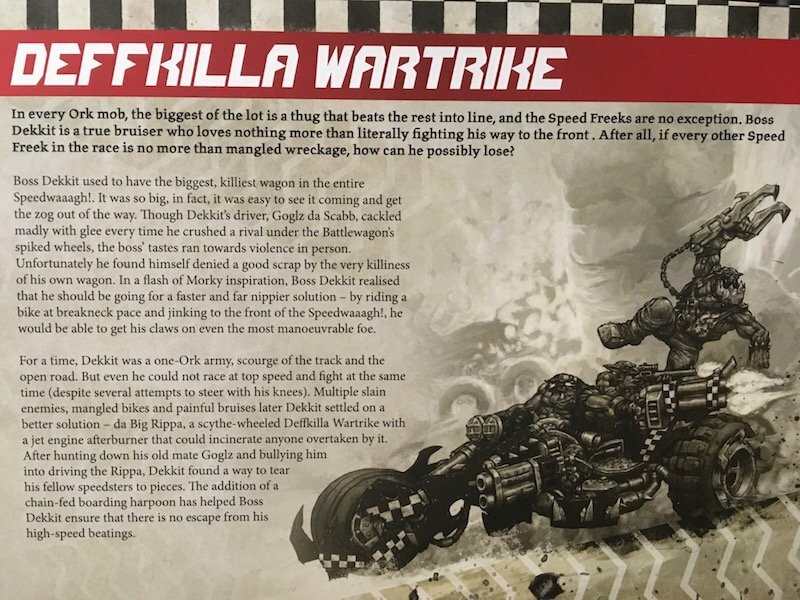 Learn the history of the Boomdakka Snazzwagon, the Rukkatrukk Squigbuggy, and the Deffkilla Wartrike! It’s vehicular combat on the desert sands of Vigilus – and you’re invited to throw down with these legendary greenskins. The Pyro-Mekaniaks of the Deathskulls like fire and firepower. 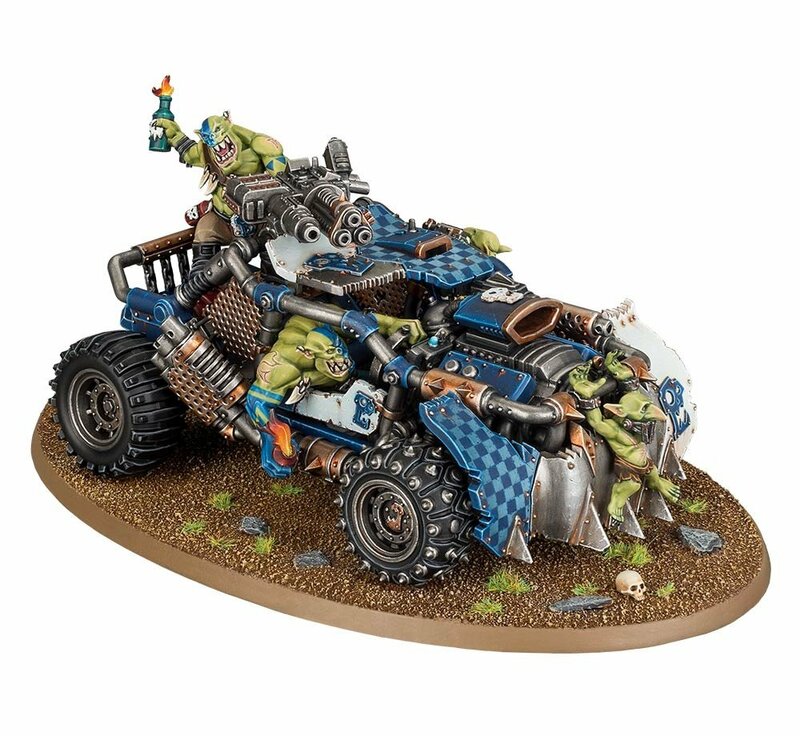 They have combined their love of explosions into the ramshackle contraption known as the Boomdakka Snazzwagon. Boasting a terrifying gun known as “Big Pyro” which has a very impressive rate of fire, this Orktacular deathmobile also brings the heat with Burna Bottle! “A highly volatile concoction of promethuim, gasoline and Big Pyro’s famously inedible nampalm squig curry” those Burna Bottles are serious business! Once they go BOOM you’ve got to deal with shards of glass and a sticky, flammable liquid that will just keep on cooking. Their targets are only one unlucky Burna Bottle away from a one-way trip to Boomtown courtesy of the Deathskull’s special sauce. 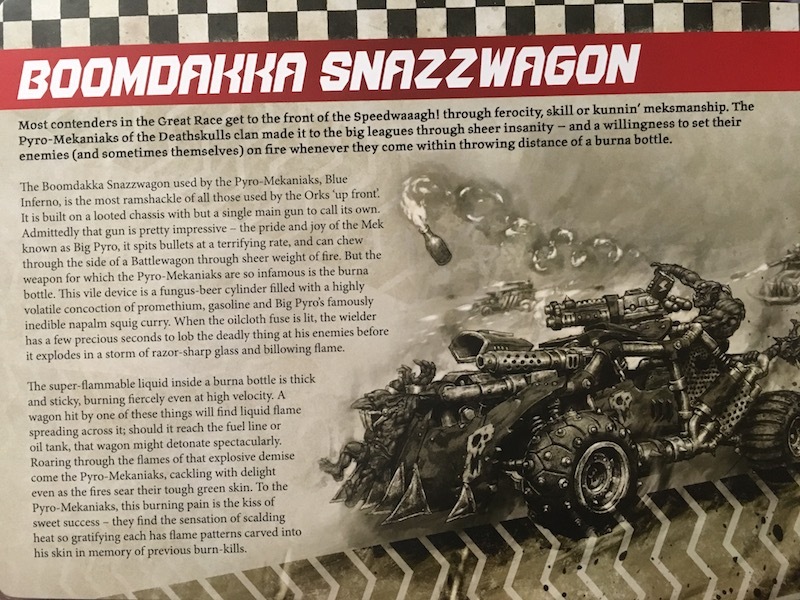 Roast your enemies with fire and firepower with the Boomdakka Snazzwagon! And maybe leave the hair squigs out of this one…no one likes the smell of burnt hair. Orks and Squigs go together like peanutbutter and jelly. Typically where you find one, you’ll find the other. 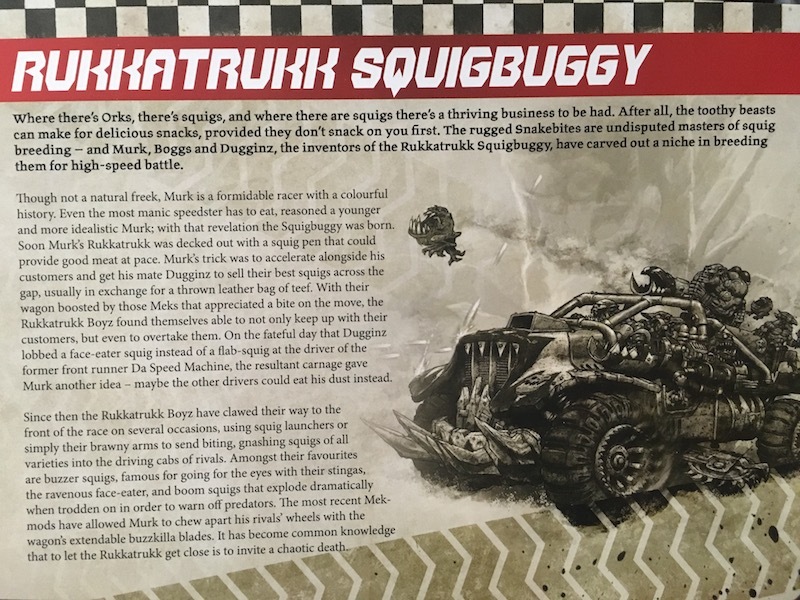 The tale of the Rukkatrukk Squigbuggy is one of an entrepreneurial Ork who took his “food-on-the-go” idea to the next logical extreme. These business minded Snakebites took their love of food (ie, squigs) on the road and it paid dividends. At first they just wanted to keep up with the racers – but eventually they had the teef to upgrade to the point where they could overtake their customers. An “accident” with a face eater squig later, they decided they could become racers themselves! The Rukkatrukk Squigbuggy gives a whole new meaning to fast food! This one food trukk who’s orders bite back – watch out for the good ol’ combo #1! 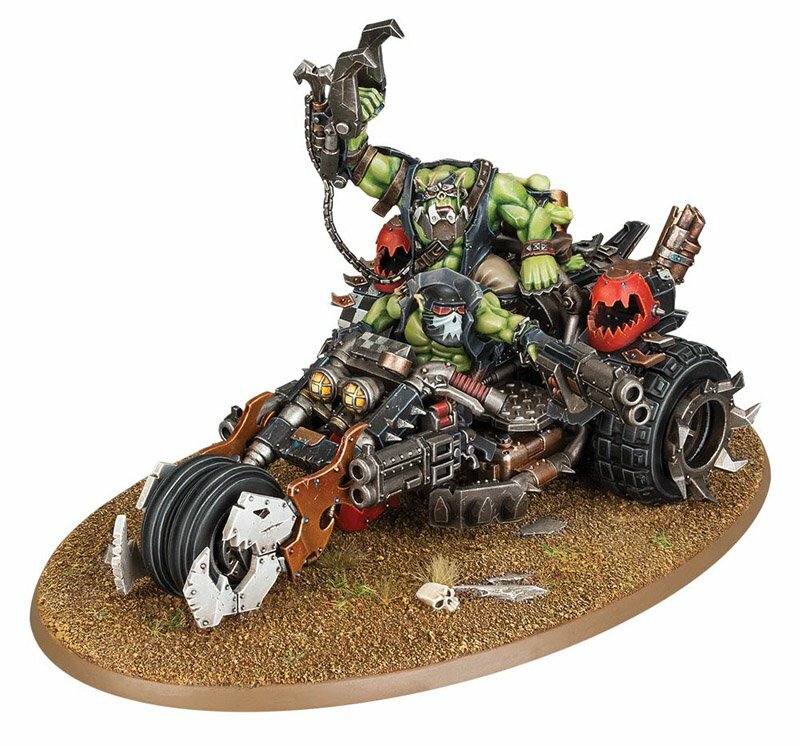 Boss Dekkit is the biggest and baddest Ork of the lot – He used to ride in the mightiest Battlewagon of the entire Speedwaaagh! Unfortunately, it was so killy, he never got to get up close and personal. Enter the Deffkilla Wartrike! A scythed-wheeled trike strapped on top of a jet engine afterburner, Boss Dekkit is able to catch even the fastest prey. 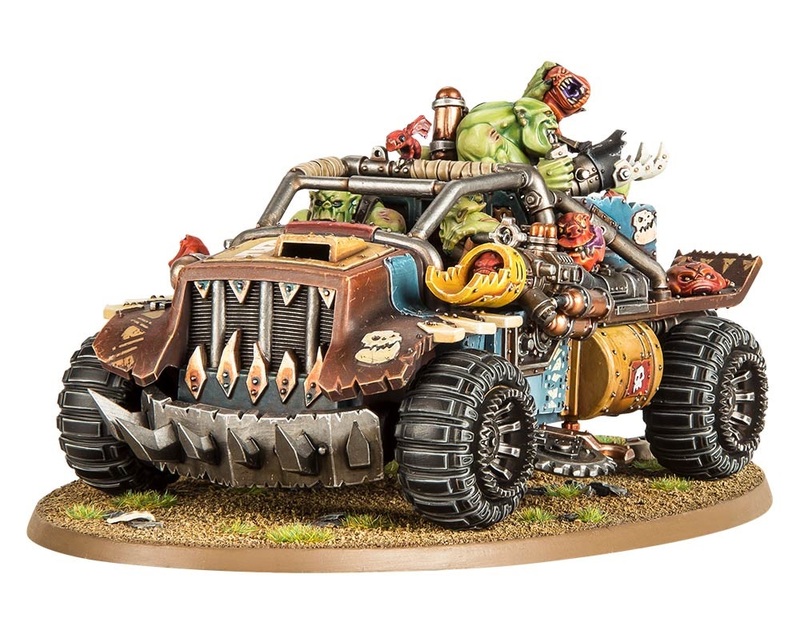 While his trusty driver Goglz da Scabb takes the wheel, Dekkit is able to get up close and start krumpin’ like any good Ork does best! Oh and if you think staying behind da’ Boss is a safe spot, think again. That jet engine can toast anyone he overtakes! If you ain’t first, you’re probably on fire if Boss Dekkit is in the lead. And watch out for that Harpoon Hook of his as well – just in case you had any dreams of escape. These Orks are race-ready and heading your way! The Speedwaaagh! is HERE!